Facebook (s fb) and a group of partners that includes Ericsson, Nokia and Samsung have launched an initiative called internet.org that aims to bring internet access to everyone in the world. Among the types of efforts they’ll undertake are making access more affordable via less-expensive devices and broader mobile networks; improving the efficiency of data handling at the application, network and server levels; and experimenting with new business models that incentivize carriers and device manufacturers to offer lower prices. The internet.org press release noted that just more than one-third of the world’s population currently has access to the internet, and that adoption is growing by a mere 9 percent a year. [M]any people who have never experienced the internet don’t know what a data plan is or why they’d want one. However, most people have heard of services like Facebook and messaging and they want access to them. If we can provide people with access to these services, then they’ll discover other content they want and begin to use and understand the broader internet. First things first: get them on Facebook! They can figure out the rest later. Getting a little for yourself while claiming to serve the greater good is nothing new, of course, even in the internet world. Google Fiber and Project Loon are impressive and possibly important efforts, but the end result if they work out it more people searching on Google, watching videos on YouTube and using services like Google TV. 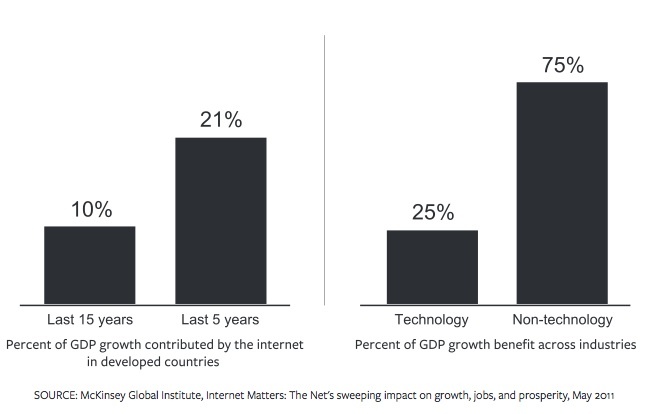 However, if internet.org is going to improve the global economy, or even Facebook’s economy, it actually has to culminate in real, working internet access in some very difficult parts of the world. The problem is that some economies aren’t capitalistic, some governments are corrupt and it’s not uncommon that the two go hand in hand. Getting access to these markets might require some capitulations and dealings that don’t align with the initiative’s utopian vision. It might even be harder and more nuanced than convincing the U.S. Congress to back immigration reform. Convincing handset carriers and international carriers to play nice might be tough, too. My colleague Stacey Higginbotham spoke with Facebook Vice President of Engineering Jay Parikh on Tuesday night and, she said, he acknowledged that carriers are excited but still wondering what this will mean of their business models. Based on the Facebook whitepaper, its initial vision around new business models revolves around a strategy called zero-rating, something Facebook already kind of does in certain countries around its Facebook Zero messaging service. Essentially, the idea goes, people want Facebook and they consume a lot of data using it. Don’t charge them for Facebook data usage, and they’ll be more able to afford phones and data plans that they might not have purchased otherwise. That’s probably the most important part of the plan (assuming most parts of the world can get some degree of connectivity). Reducing load on carrier networks should help get them on board, as will potential advances in Open Compute Project technologies that lower the cost of operating those networks. More efficient data consumption means people in developing countries (including those where people have no choice but to buy prepaid data plans on SIM cards because there’s no credit card system in place) can actually benefit from internet access without burning through their allotted data in a day. With that in mind, internet.org is looking to make advances in fields like caching (both locally on devices and on edge networks), data compression and good, old-fashioned smarter application design. Facebook, for example, noted how it expects to lower the average daily consumption of its Facebook for Android app to 1 megabyte from 12 megabytes. With a special variant in developing countries that’s less photo-intensive, Facebook thinks it could get data usage even lower. Connectivity is not a human right as Facebook CEO Mark Zuckerberg likes to claim — in fact, it probably ranks well below potable water and free speech on the list of things that should be — but it is increasingly important. The web’s promise goes well beyond social networking and into areas like general information awareness and new paradigms for higher education. If Facebook, Google or anyone can actually deliver universal connectivity at a price point that makes everyone happy, the more power to them. Not only that, but with FB being in bed with the Feds, I hope the citizenry comes to its senses and relegates Zuckerberg and company to Myspace status. Surveillance is on its way to being the Internet killer and it is time that social and the cloud die so that the Feds lose some of their power. Its appears a good initiative and all the partners are really good with technology but as stated in the article, it will take much more than what they have thought on it till now. Not every one will be aligned with the idea of spreading internet. Many people in developing countries still do not believe in internet and they will oppose to this idea. Wow David, it’ll be twelve years next month that we’ve been disagreeing about this stuff in blog comments. Scott, yes there’s consistency in my point of view — the findings from more than two decades of empirical research on this topic do tend to influence me.